Continuing its roll across the United States, Stampede’s 2016 Big Book of AV Tour and Conference Series will make its next stop in Washington, D.C. on September 22 at the Sheraton Pentagon City Hotel. The one-day reseller, end-user conference and tech showcase will run from 10 a.m. to 2 p.m. Attendee registration is now open. Beginning at 10 a.m., a complimentary breakfast will be served to guests as the Tech Showcase Exhibit opens, where top ProAV Manufactures will showcase their newest products and technologies. At 10:30 a.m., the presentations will begin, starting with: “NEC 10 Steps to a Successful Video Wall,” by Mark Weniger, account manager, channel sales, NEC; “Overview of the Drone/UAS Industry and Business Potential,” by Rob Luther, Drone Video Systems; “Enterprise Video Asset Management for Public Safety and Law Enforcement,” by John Riehl, executive vice president, VideoBank; “Drone Video Systems: A New AV Category for A New Age of Opportunities,” by Rob Luther, Drone Video Systems; “Cut the Cords: BYOD and Wireless Presentation From Any Device,” by Cary Benjamin, business development manager, WePresent; and “Atlona, 5 Things You Need to Know Before Installing 4K,” by Amelia Vrabel, national sales manager, Atlona. Showcasing the latest advancements in the ProAV market, Stampede’s Big Book of AV Tour and Conference Series provides attendees with technology updates, exclusive insights, and keynote sessions from leading names in the digital signage, audio, projection, and signal distribution industries while also offering training forums for total business needs. Current participating tour exhibitors include: AEE, Atlona, AVTEQ, Casio, Chief, Christie, DJI, Display Ten, Epson, Hitachi, HuddleCamHD, JELCO, Just Lamps, Ken-A-Vision, LG, Luidia, Lumens, Luxel, Mustang, NEC, Oklahoma Sound, Optoma, Peerless AV, Philips, Planar, Premier Mounts, Revolabs, Ricoh, Samsung, Sharp, Stewart Filmscreen, TAP it, TSI Touch, Unmanned Vehicle University, Vidyo, WePresent, WilsonPro, and xFOLD. 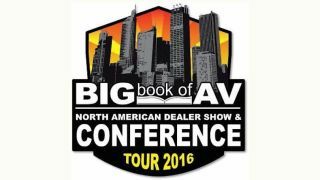 Every attendee of the 2016 Big Book of AV Tour and Conference Series will receive a $500 Stampede Credit, $50 American Express Gift Card, and be entered into a drawing for the chance to win one of two DJI drones.